I am a sucker for fun knife cuts. If a recipe involves playing with knives and slicing vegetables, count me in. This isn’t to say I am entirely comfortable with my skills although I have been taught my entire life how to clean, sharpen and respect a chef’s knife (thanks, Daddy). It has more to do with the feeling I get when I focus on a repetitive creative undertaking. When I was a child my parents were folk artists who worked diligently to pump out their hand crafted art like machines. My mother used to sit behind this tall wooden work bench listening to talk radio while she painted hundreds of beautiful little cottages, pretty letters, animals, and trees. Sometimes, depending on the holiday, every surface would be covered with tiny hand painted Santas, bunnies or turkeys. I learned at a young age how to meticulously paint small wooden objects, and made a game to see how many I could paint in an hour. It was tedious, consistent, and amusing work much like chopping vegetables. These days the cutting board is my canvas, the knife is my brush, and food is my paint. Warm Zucchini Thread Salad is bursting with comfortable Italian flavors and is easy to prepare. The more laid-back approach to this salad would be to use a mandolin to thinly slice the zucchini, but I don’t have to tell you I did not use one. This salad is served warm out of the pan. It is velvety with a slight punch of tartness from the red wine vinegar, and a happy crunch from the pine nuts. Before anything else, rinse and drain the beans. In a small bowl, toss the beans with salt, pepper, a dash of olive oil and a dash of red wine vinegar. Set aside to marinade. Slice the zucchini lengthwise into long flat strips. Then, thinly slice the flat strips lengthwise to make thin ribbons. Heat a large sauté pan with a lid to medium heat. Add olive oil, smashed garlic, red pepper flakes. Infuse the oil; about 2 minutes (be careful not to burn the garlic). Add sliced onions and gently cook until golden; about 5 minutes. Take out the whole garlic cloves. Add the zucchini threads and combine them carefully with the onions. Cover and steam; about 5 minutes. Remove lid; add red wine vinegar and toss the ingredients gently; cook an additional two minutes until the zucchini is tender. Turn off the heat. 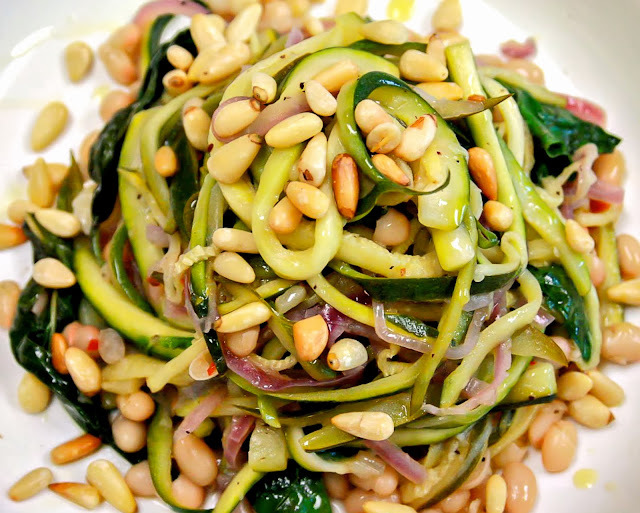 Toss zucchini salad with small white beans and fresh basil leaves. To plate twirl the warm salad in the middle of the plate. Top liberally with toasted pine nuts. Beautiful dish! I wish I'd had this for dinner tonight. Lovely dish. I like that you used zucchini in place of pasta. WOW!! This looks incredible! It almost looks to perfect to eat...almost! I would love to try this salad recipe and I normally have such for dinner. Looks so good but suppose I can replace the pine nuts to peanuts and maybe try with cucumber?? My kind of food for sure. Aha, peaches sounds like a winner on that dish. Thanks! Have a wonderful weekend. I'm not as good with my knife cuts as I should be--I cheat with the mandoline and some great peelers where possible. But that salad is the real deal--the first photo is gorgeous and this is totally something I would eat! This is really gorgeous! It sounds like you're extremely skilled with your knife and it shows in your food! This looks just absolutely fabulous! I'm actually a little afraid of mandolines so I prefer the knife also. You really did create a work of art! I just love the look of this salad. So refreshing! Your description here really does make you want to eat this, you did some great food writing there-yum! Also you picture gives you a clear picture of all the wonderful ingredients in there. In total, you have won me over -Buzz buzz. Have a great weekend! I love zucchini, this salad sound fresh and wonderful for spring! This looks delicious!! I love zucchini! Wow - I have so much to say. First off...YUM! What an amazing dish - so beautiful and I bet it tastes amazing! Secondly, I had NO idea your parents were folk artists! ...that's cool! Third? You absolutely painted a picture with your words today - really, beautifully done! A very fresh and beautiful spring salad! I love colorful salads, and this cut gives it a different texture. Delish! This is beautiful!! I've heard about zucchini thread/pasta last year and wanted to try, but then forgot about it. I really need to try this soon! I loove this salad. I need to pin this! This is a very interesting recipe- looks so good! You have more patience than me with all the slicing and cutting, although I do enjoy how nice the dish looks when it is all finished. Oh, I love how you equate cooking to art...it is art after all! I love to cut too, its very therapeutic for me and love getting into that rhythm. This recipe looks perfect for those chopping cravings, and absolutely delicious! So beautiful! The flavors are amazing, but you are so right... the cut takes this from yummy to spectacular! And the pine nuts look so amazing, I want to reach in to my computer screen and grab one! The flavors and textures in this look incredible. Looks like a perfect side dish for summer grilling!